GARDEN CITY, N.Y. — Former MLB first baseman, Keith Hernandez, is scheduled to appear on Sunday Jan. 31, 2016 from 12:00 pm to 1:30 pm to meet and greet fans. The World Series champ will sign autographs and memorabilia at the Steiner Sports Store located in the Roosevelt Field Mall in Garden City, NY. For more information, click here. $486 for the whole ’86 team! Keith Hernandez is a former starting first baseman on World Series championship teams with the St. Louis Cardinals in 1982 and the New York Mets in 1986. He began his career in the majors with the Cardinals in 1974, winning the National League (NL) batting title and sharing the circuit’s Most Valuable Player (MVP) honors with Willie Stargell in 1979. After a midseason trade sent him to the Mets in 1983, he became the undisputed leader amongst the players of the brash ballclub that also fell a victory short of capturing the 1988 NL Championship Series. Hernandez appeared in five MLB All-Star Games and hit better than .300 six times between 1979 and 1987. Generally considered one of the best defensive players at his position, he was awarded the Gold Glove in eleven consecutive seasons from 1978 to 1988, the most by any first baseman in baseball history. He retired as an active player after spending one year with the Cleveland Indians in 1990. He is currently a baseball analyst working on Mets telecasts for SportsNet New York and WPIX since 2006. PFP Sports & Celebrity Talent Agency is a booking agent for motivational sports speakers and celebrities. 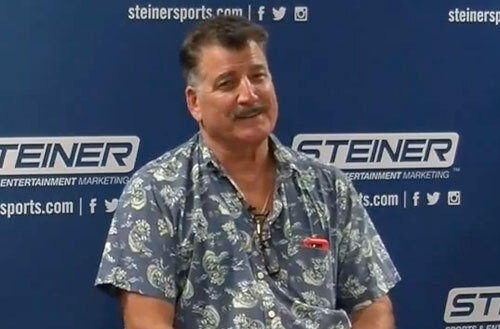 If you would like to book MLB speakers like Keith Hernandez for a speaking engagement, personal appearance or special event, you can request Keith Hernandez agent and speaker information from PFP Sports & Celebrity Talent or call 800.966.1380.